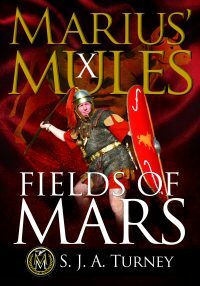 The war in Gaul is over, but the fight for Rome is only just beginning. Denied his consulship by the senate and nearing the end of his term as governor, Caesar waits at Ravenna with one legion, making a last attempt at reconciliation. Threatened with prosecution if he returns to Rome, just one path is becoming clear: war against the senate. Fronto and Galronus are bound to the service of the Proconsul, facing a war against other Romans, and able neither to prevent nor avoid it. Caesar’s path to safety will take them the length of Italy, and to familiar old lands in southern Gaul and Spain, where their friends and family now wait, believing themselves safe from hostilities. With a new officer stirring up trouble, Pompey and the senate defying them, a father-in-law busily incriminating himself and powerful Roman generals consolidating positions against them, Fronto and his friend are bound for that worst of all conflicts: Civil War.